Delicious, melt-in-your-mouth dairy-free hazelnut chocolates. Vegan, gluten-free, and grain-free. 1. Process all filling ingredients in a food processor into a fine sticky crumble. Test a small amount of the mixture by pinching a touch of it with your fingers — if it sticks together nicely, you’re good to go. If it’s too dry / crumbly to stick together, adjust the recipe by adding a tbsp of water and process again to combine. 2. Grab approximately a tbsp of the mixture and roll into a ball with your hands. Set aside. Repeat the process with the remaining filling mixture. When done rolling the balls, place them in the freezer for 10 mins (or refrigerate for 30 mins). **** Likewise, place a small metal tray lined with parchment paper in the freezer while the filling is chilling. 3. Prepare the coating by melting your chocolate. Once ready, remove the parchment lined metal tray from the freezer and have it nearby. Place one of the chilled filling balls on a fork and briefly dunk in the melted chocolate mixture to coat. Glide the fork tines along the rim of the bowl / container the chocolate is in to wipe off excess chocolate coating, and carefully set the chocolate ball on the tray. Repeat the process with the remaining balls. 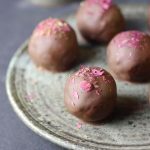 Sprinkle with rose petals (note: you need to get the petals on the chocolate before it fully dries, so have to work fast with the coating and sprinkling!). Then place the tray in the fridge and chill for 10 mins. Enjoy! Keep the chocolates refrigerated until ready to eat. *The hazelnut butter should be creamy. If it’s old / on the thick side, it might affect the flavor and texture. **You can melt the chocolate chips using a double boiler method. Alternatively, if you prefer to make a chocolate coating from scratch, use this magic shell recipe (keep in mind that the magic shell melts more easily as compared to the regular chocolate coating). Also note that this amount is more than what you’ll need for the recipe (you need to have enough chocolate so that the balls can be coated properly, but that means some will be left over), so freeze the remaining melted chocolate in some silicone cups and store for future use. ***Adding the cacao butter helps to thin the melted chocolate a little so that coating is easier. You can melt the cocoa butter along with the chocolate chips in the double boiler. It also deepens the chocolate flavor a little. Alternatively can use coconut oil instead. ****Chilling the balls helps the chocolate coating to set faster and neater.